Correspondence received by the Adjutant General's Office. Colonel Thomas J. Anderson served as the Kansas Adjutant General from April 1, 1865-August 18, 1867. Some of the topics discussed include the newly elected officials of the Mission Creek township militia in Wabaunsee County, residents of Baxter Springs seeking militia protection from bushwhackers, correspondence with E.B. 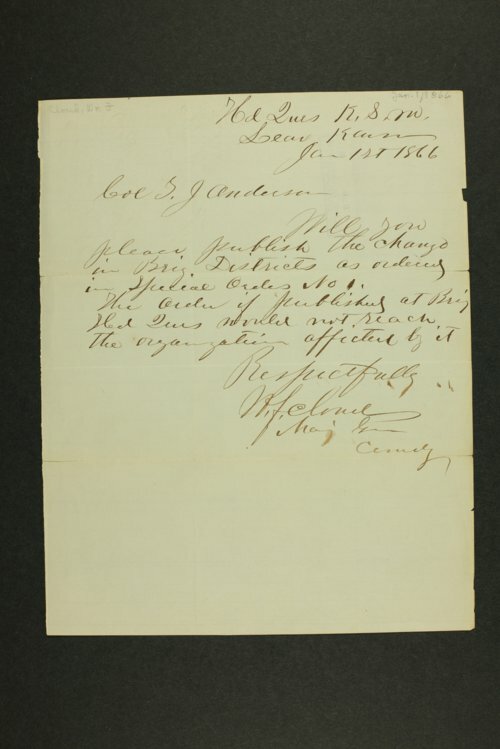 Taylor, Superintendent of Indian Affairs for the Northern Superintendency in Omaha, relating to testimony given by Pawnee Indians on charge of murder at Solomon's Fork, monthly enlistment reports for the 13th U.S. Infantry and 18th U.S. Infantry, and a letter from Clara Barton on behalf of the Office of Correspondence with the Friends of the Missing Men of the United States Army.